Innovative leadership is essential to effective implementation of blended and virtual learning. RIDE celebrated Digital Learning Day by sending all Rhode Island superintendents, curriculum directors, technology directors, and principals a copy of BLENDED - Using Disruptive Innovation to Improve Schools! The book BLENDED provides detailed information about the strategy, design, and implementation of a successful blended learning program. Teams from each district will discover a useful framework for implanting blended learning; unlock the benefits and mitigate the risks of online learning; find answers to the most commonly asked questions surrounding blended learning; and create a more student-centered system that functions as a positive force across all grade levels. The U.S. Department of Education today released model terms of service guidance and a training video aimed at helping schools and districts protect student privacy while using online educational services and applications. The guidance offers examples of terms of service provisions to help school officials identify which online educational services and applications have strong privacy and data security policies and practices. WHERE CAN I LEARN MORE ABOUT HOW DATA ARE USED AND PROTECTED? Learners in Rhode Island are assured access to quality instruction and learning opportunities through the Virtual Learning Regulations as well as, the Basic Education Program, the Secondary Regulations, Career and Technical Education Regulations, the Rhode Island Teaching Standards and the Education Evaluation Program. The Virtual Learning Regulations complement and enhance existing regulations by promoting students access to quality online learning opportunities as part of each student’s pathway. Below are tools and resources that may be used to aid in the evaluation of content, instruction and programming. This list will grow as additional resources become available. 2014 Letter of from Richard Culatta, USDOE, to help State, district, and eligible partnership grantees better understand how they may be able to use their federal grant funds to support innovative technology-based strategies to personalize learning. Reimagining education is not easy work. It is messy but important work. As in the iceberg illustration to the right, success is like an iceberg. What people see is the large portion of the iceberg that is above the waterline. What people don't see, below the waterline, is the persistence, failure, sacrifice, disappointment, good habits, hard work, and dedication it takes to support and hold up that success. District and school leaders struggle with how to build in-house capacity and create equity across schools. Those districts that are making it happen have three characteristics in common: they manage change holistically, they are comfortable with multiple iterations, and they sustain efforts operationally and financially. The following tools and resources support these efforts. What is Your Rally Cry? Begin with an aspirational goal and communicate it in a SMART (specific, measurable, assignable, realistic, and time related) way. Specific - Does it target a specific area for improvement? Measurable - Does it quantify or at least suggest an indicator of progress? Assignable - Who will be responsible? Realistic - Can results be achieved realistically, given available resources? Time-Related - When can the results be achieved? The Future Ready Dashboard is a useful tool to help manage identifying core opportunities, areas of "non-consumption", and threats vs. opportunities. Non-consumption exists anytime schools cannot provide a learning experience. It is FREE to create an account and use the dashboard. After defining their rally cries, leaders should organize the right teams to lead the projects. Everyone involved plays a critical role in implementing innovative change. Leaders take the first step by defining a set of sustaining and disruptive problems and goals that serve as the organization's rally cries. The second step is to develop sound strategies for involving the right teams of people to move the innovative work forward. The trick is diagnosing the desired level of change, which determines what type of team is necessary and ultimately who needs to be at the table. Functional, lightweight, and heavyweight teams are best suited to address rally cries that are core opportunities. Autonomous teams are right for tackling areas of non-consumption. Non-consumption exists anytime schools cannot provide a learning experience. Whenever a school or district is solving for a variety of problems and trying to undertake a system-wide transformation, it will likely use several different types of teams for different purposes at different times. It is not necessary at this stage for leaders to know what model of blended learning they want to deploy or what the design of the program will be. They should, however, have a sense of the scope of change that they want to see happen. A wise leader will look to the future and protect the disruptive projects addressing the areas of non-consumption. The initial communication is that failure to act disruptively poses a substantial threat to the organizations success. A carefully choreographed shift in the dance moves the focus of communication to the upside of the opportunity for students, teachers, and the community. Further details about the flexible teams described below are found in the book Blended, Using Disruptive Innovation to Improve Schools, Michael Horn and Heather Staker, 2015. The simplest type of problem to be solved is a functional problem. These are problems that deal with improving just one part of a product or one step of the process. Often this type of work can be confined within a department or grade level. A functional team works best to make improvements at the component level. For example, as in the functional team graphic, there is a representative for each component, in this case, the department heads of each content area (math, science, English, social studies) and a lead teacher representing a particular grade level. Together, this group is well suited to improve the performance of each component. The second type of problem to be solved is making improvements that affect how another group needs to do its job. When there is a predictable interdependence between groups, managers should organize a lightweight team to handle the project. Lightweight managers go back and forth among groups working on tasks to ensure that their work fits together correctly. In the lightweight team graphic, the team members from each component report directly to their department head or team leader to provide information about what is going on in that particular component. Then, the department head or team leader reports directly to the project manager for input and suggestions for tweaks in each component. A lightweight team is well suited to change specifications for how components must fit together. Sometimes an organization is looking for a significant breakthrough improvement - one that rethinks the whole architecture of the product itself. This can require combining, eliminating or adding new components or require components to assume different roles in the products' performance. In other words, the components and people responsible for them need to interact differently with one another in ways that were not predicted at the onset. This often means people must trade off one department's interests for the other's to achieve an optimal level of performance. In the heavyweight teams graphic, the project leader has direct report over the team members within their components and can more strongly direct how the components fit together, what is happening, and make more significant changes. Autonomous teams are critical when the task involves launching a disruptive model. A disruptive model runs parallel to other models and does not compete. An autonomous team is a tool to create a new model that can profitably serve a new market - one in which people were not being served or needs were not being met. The disruptive project needs to have the freedom to create new processes and to develop new priorities. The people on the autonomous team must benefit from consistently prioritizing the disruptive opportunity over any temptation to compete against things already in place. Schools should use autonomous teams when they want to do away with the factory-based classroom completely and replace it with a disruptive blended-learning model. In the autonomous teams graphic, the team itself is separate from the components and their department heads or lead teachers. They are well suited to develop and implement a disruptive model in which the product is used. More details about organizing teams found in the book Blended, Using Disruptive Innovation to Improve Schools, Michael Horn and Heather Staker, 2015. Do it yourself step-by-step design worksheets can be found at the Blended Learning Universe. The Future Ready Dashboard is a useful tool when planning, implementing and assessing improvement. It is FREE to create an account and use the dashboard. Brain research has advanced and has real implications for adults and students. Brain researcher, Carol Dweck, who parsed the difference between a "fixed" and "growth mindset", found that peoples’ mindsets—how they perceive their abilities—played a key role in their motivation and achievement. She found that if we changed students’ mindsets, we could boost their achievement. More precisely, students who believed their intelligence could be developed (a growth mindset) outperformed those who believed their intelligence was fixed (a fixed mindset). And when students learned through a structured program that they could “grow their brains” and increase their intellectual abilities, they did better. As shown through contrasting "fixed mindset" statements versus "growth mindset" statements in the graphic, a fixed attitude or mindset sees a certain status quo, opinion, event, or condition as an end point, with no need to continue trying to improve, even if the condition is a positive one such as success. Instead, in a growth mindset, people believe that their most basic abilities can be developed through dedication and hard work. Brains and talent are just the starting point. This view creates a love of learning and a resilience that is essential for great accomplishment. Virtually all great people have had these qualities. Teaching a growth mindset creates motivation and productivity in the worlds of business, education, and sports. It enhances relationships. Change is multidimensional with several components that must be in place to reach the desired outcome. This chart helps to make the conversation productive. The requisite components for successful change are: vision, skills, incentives, resources, and an action plan. When one or more of these components are missing, strong emotions are triggered. For example, with no vision, there is confusion; with no skills, there is anxiety; no incentives, there will be resistance; no resources results in frustration; and no action plan leads to many false starts. Once a component or emotion is identified, leaders and educators ask what solutions must be put in place. Innovators are ahead of their peers and often have great ideas. Be sure to listen and ask for their INPUT on how their vision could be implemented. Early adopters often try out new things. Be sure to allow time for EXPERIMENTATION, and encourage them to share their successes and collaborate with others. Those in the Early Majoirity are often know for asking "Why?" Be sure to explain WHY the initiative is important. By helping to conect the dots, you are building great momentum towards ensuring your initiative's long-term success. Though similar to those in the Early Majority, those in the Late Majority are more skeptical. They want PROOF that something will work before they are willing to try it. Be sure to point out similar initiatives at other schools and call on Early Adopters to build their enthusiasm. Laggards FEAR CHANGE. Ease the transition by guiding them through the training process. Be susre to show the proven benefits of the change, emphasizing why the change is important and its long-term impact. Marginalizing their big ideas. Withholding untested tools Not explaining why the initiative is important. Not providing proof of the initiative's possible impact. Forcing them to accept changes. Because they try things before training is available, Innovators don't need traditional PD, but instead an outlet to share what they have discovered. Give them an outlet to share their big ideas with others. Early Adopters thrive on sharing stories about the latest tool or trick they have successfully implemented. Recruit them for train-the-trainer positions. They are excited by tools that make instruction easier. Their excitement will quickly spread and grow your initiative. A little encouragement goes a long way with those in the Early Majority. If you clearly show them why they are being asked to do something, the Early Majority will jump in with both feet. Introduce them to the "big ideas" and they will be able to determine the right path for success. Inspire this group and you will be impressed with the results! Though more receptive to change than the Laggards, those within the Late Majority often still need a guided path. Try providing step-by-step instructions. If you are planning to do a formal training session, individuals that fall within the Late Majority do best with small face-to-face workshops that allow them to not only gain confidence, bu build on each other's excitement. 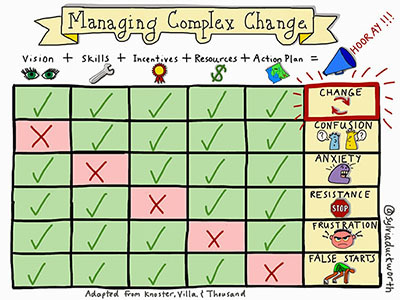 Because they are resistant to change, many Laggards need extra instruction and support to help them adjust to change. Provide access to a 24/7 online resource for them to find answers to their how-to questions and recommend or assign training and progress reports to ensure they ar on track and up-to-speed with their peers. Digital Learning requires shifts in how schools and districts budget their funding and allocate resources. It also requires careful long-term planning to consider the total cost of technology, considering technical support, annual licenses, and replacement of out-of-date equipment. The resources for this element provide information about addressing these complex issues. Education Resource Strategies’s (ERS’s) ResourceCheck® tool helps district and schools look at how they use resources by asking a series of questions, and then analyzes the responses. It provides data on areas in which districts need improvement, how close districts are to best practices, and links to resources to take action. CoSN K-12 Total Cost of Ownership (TCO) Leadership Initiative provides information about TCO, aTCO assessment tool (requires requesting a free password for a school), and case studies of school districts that have used TCO analyses. CoSN K-12 Value of Investment (VOI) Leadership Initiative provides a methodology and tools that enable K-12 school leaders to better measures and articulate the costs and benefits of proposed technology projects. The website also contains case studies to show how the VOI concept can be applied. CoSN Green Computing for K-12 Schools Leadership Initiative provides tools, tips, and resources for school technology leaders to help reduce their school district carbon footprint. Implementing blended learning is complex. School districts must clearly describe the benefits of blended learning in order to build support among key audiences. Developing and prioritizing a comprehensive communications plan for a blended learning implementation effort is a critical initial step in building engagement, trust, and credibility. A group of educational practitioners, scholars, business people, parents, and advocates with an extraordinarily diverse set of backgrounds, positions, and perspectives converged to re-imagine education. Collectively they are engaged in blended learning, disruptive technology, deeper learning, connected learning, personalized learning, social and emotional learning, community schooling, out of school learning, teaching improvement, the teaching profession and its collective leadership, school choice, and more. Recognizing their strongly held beliefs and often divergent views, they were determined to create a vision of the future of education. Emerging lessons and a new tool for state and district leaders Working to build a culture of innovation.